This painting depicts the bodhisattva Fugen (Sanskrit Samantabhadra), his hands clasped in a gesture of prayer. 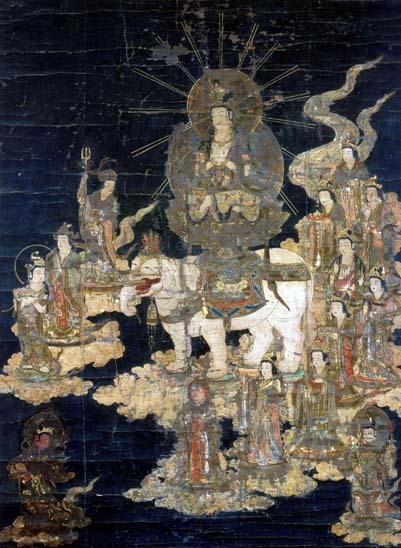 He is arriving on a cloud astride his traditional mount: an elephant (rokuge byakuzo), whose six tusks symbolize the six cardinal virtues of Buddhism. This bodhisattva incarnates Practice or Application and appears here- against a plain ultramarine background -as the principal icon on a lotus flower plinth, with two golden haloes from which radiate twin rays of light executed in kirikane.The procession of divinities escorting Fugen bosatsu is a characteristic feature of this painting’s iconography: the cortège is formed by the ten Rasetsunyo (Sanskrit Rakshasi), female figures with superhuman powers. In fact their function is very similar to that of Fugen himself: to protect the faithful believers of the Lotus Sutra. In the foreground of this scene, at the two lower corners of the painting, a pair of haloed guardian kings is portrayed. Stylistically, this work is typical of the Kamakura period in its dynamically expressed movement, realistic depiction of certain facial appearances and attitudes, and the shimmering overall harmony embellished with gold. All the elements of the finery and attributes are painted in kindei; only the rays of the halo are executed in kirikane, with an underlying “tan” vermilion to give added brilliance. It nevertheless retains certain esthetic features of the late Heian period (794-1185). The linear face of the divinity, for instance, is reminiscent of the 12th century Fugen bosatsu in the Tokyo National Museum collection. The bold ink outlines of the Rasetsunyo’s Chinese robes on top of the coat of bright colors evokes the second, “colorist” style of the Heian period. Moreover, these figures display iconographic affinities with those which feature in the painting of Fugen in the Rozan-ji dating from the late Heian period.